Seriously, Ms JC will soon have her own label in this blog- "JC's Faves"; "JC's Cravings"; "JC's Requests"; etc. and really there's a lot of possibilities but I'll think about it if, and when it happens. So I was suckered; challenged; intrigued, etc. into making these cupcakes. Hold on, they're not your average cupcakes slathered with butter cream or chocolate ganache frosting. Can you imagine vanilla cupcakes with the dessert diva crème brûlée nestled at the center so that when your fork or knife runs through it, you hear the crack from the hardened but brittle caramel and then it's all softness from the cupcake and creaminess from the custard inside? Truly a symphony of such wonderful textures and flavors that plays in your mouth with each bite. 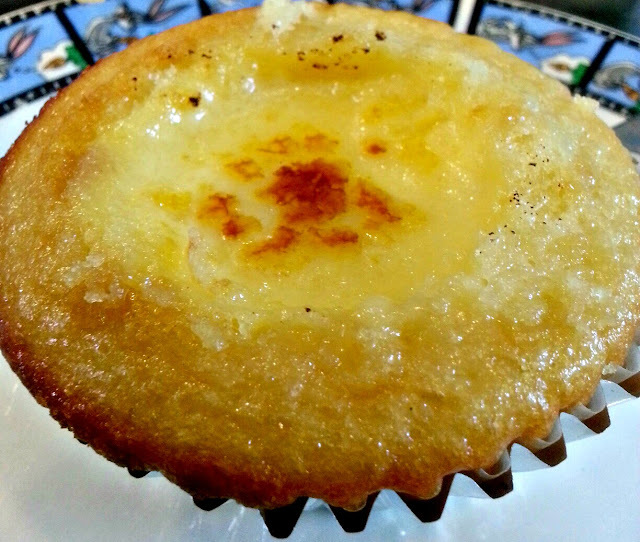 The base should be the best vanilla cupcake in town so use only good vanilla and of course nothing beats homemade so I prefer to make the creme brulee from scratch. So thank you Ms JC for the inspiration; Megan Seling for the concept; the vanilla cupcake and crème brûlée recipes are mine. 1, Preheat the oven to 350 degrees F and line a muffin pan with cupcake liners. 2. In a medium bowl, whisk together cake flour, baking powder and baking soda- set aside. 4. Add sugar and continue to beat for half a minute. 6. Reduce mixer speed to medium/low and slowly add flour mixture in two additions alternating with buttermilk (also in two additions. Beat until just combined and smooth. Make sure to scrape the sides and the bottom of the mixing bowl. The batter should be thin. 7. Pour batter into the paper-lined muffin pan. Fill to about 3/4 full. 9. Using a melon baller or cookie dough scoop, scoop put the center of each cupcake, leaving about an inch border all around but make sure no to tear all the way through the cupcake liner. Set aside. Save the crumbs to snack on or eat them while prepping the creme brulee- it's your call! It's yummy! Now it's time to make the creme brulee! Transfer back to the saucepan and simmer on low stirring continuously until it thickens enough to coat the back of a wooden spoon. Pour the mixture into the cupcakes, until they’re full, but not overflowing. Allow the cupcakes to sit at room temperature for about an hour, then refrigerate for another hour or overnight. Just before serving, sprinkle granulated sugar over the cupcakes, place in a baking sheet and stick the under your oven’s broiler for about 3 minutes, or until the sugar has melted. You could also use a culinary torch, which is even better. Just make sure you have that glassy caramel finish on top or it's not creme brulee. Too bad dark specks appear when the flame comes in contact with sugar on top of the cake but sugar on top of the custard just turns lovely as it burns. You are a genius and creates magic in your kitchen!!! This cupcake tastes divine and I am so thankful to have tasted one myself!! WOoweee!! I believe it's my turn to make a request! But I simply love everything you make.......guess I am a true fan!!! These look incredible! I bet they would be wonderful with some candied raspberries. I've had issues finding a vanilla cupcake recipe that isn't dry, but this one sounds like it would do the trick. I might even try it as regular cupcakes before diving into creme brulee mayhem. Thank you! 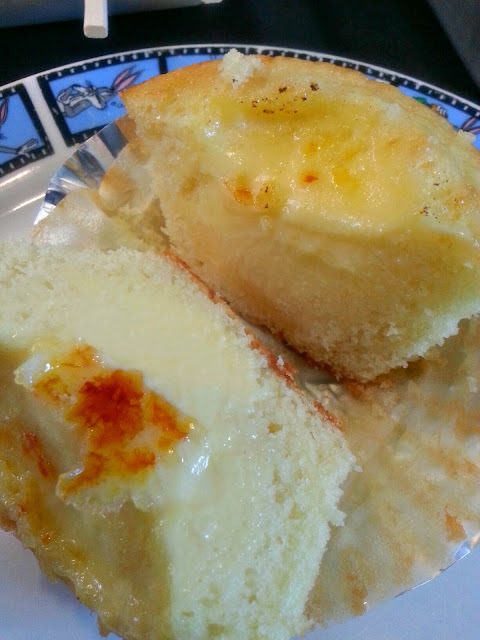 I'm confident you'll love the vanilla cupcake recipe- in fact the cupcakes are so good you can skip the creme brulee lol. Thanks again for another dream come true. I savored every stinking calorie of these beauties. Mr. C devoured them in seconds. Is there ANYTHING you can't do, my dear? I don't think so!! Love you!! !